Life is good because it’s finally pool season! A couple of weekends ago I was invited to join some beauties for some good ol’ pool party fun! Not sure if any of you do this, but during the summer months, I’ve got a pre-packed pool bag ready to go at all times because I really don’t want to waste anytime packing my stuff in case someone calls for a last minute party! 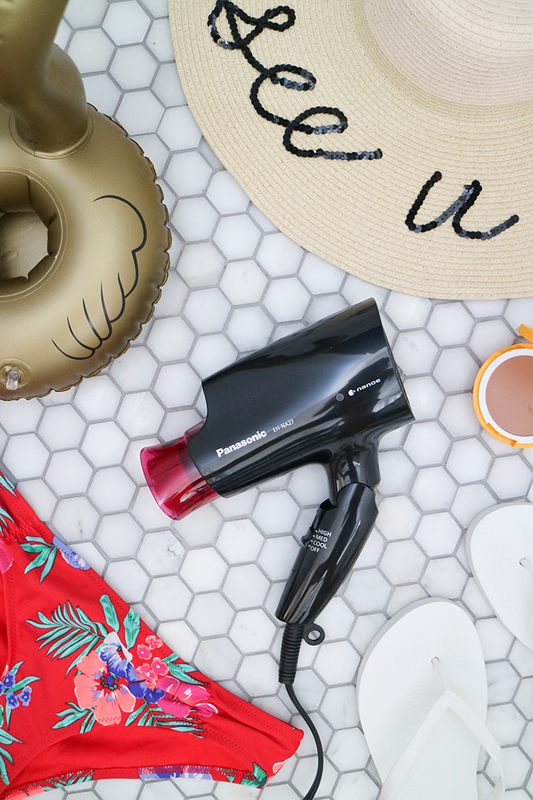 Besides the usual list of pool bag items such as sunscreen, a towel, change of clothes, and a hat, I also like to bring along a Panasonic’s new Nanoe™ Compact Travel Hair Dryer because I want to be able to immediately wash the chlorine out of my hair and style it before heading out again! 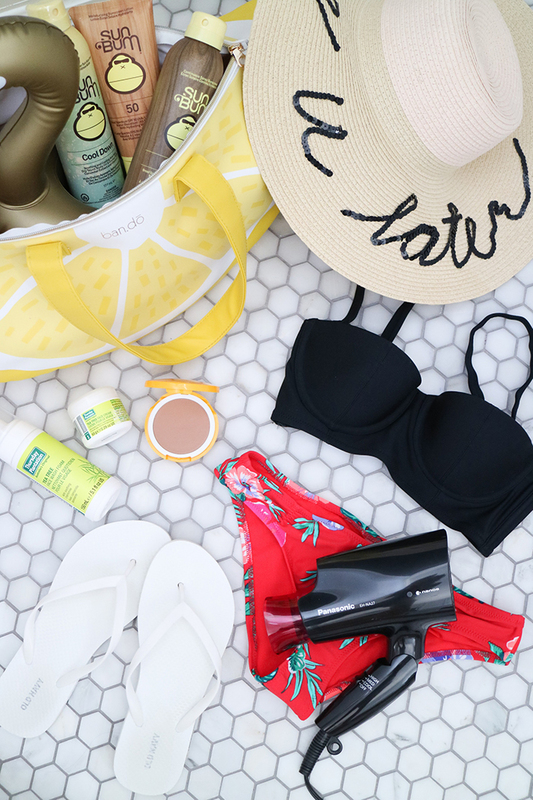 If you like the sound of a pre-packed pool bag, keep reading for my list of must have products! 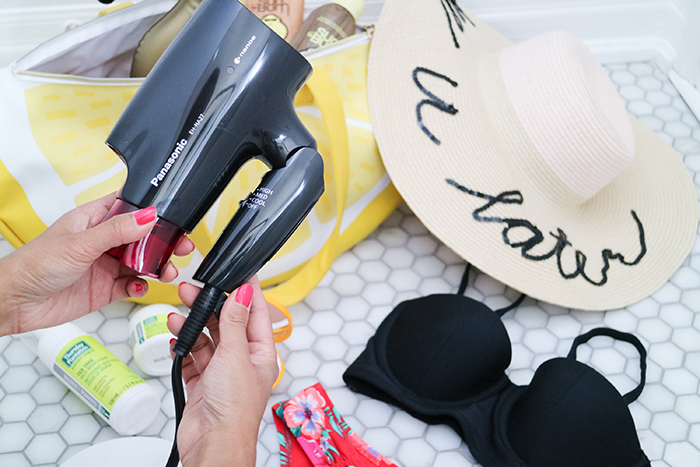 Every girl needs a travel hair dryer. 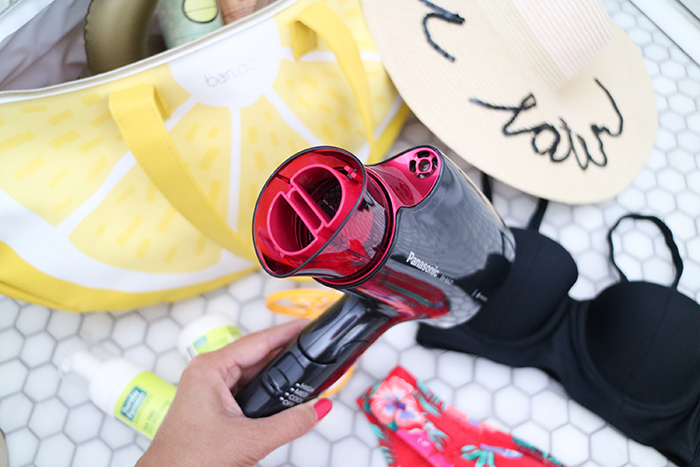 Regardless if you’re packing for the pool, the gym, or for your next getaway, a travel dryer is a must have. I despise the ones at hotels; they never have the right airflow or temperature setting, and well, to me, they’re not very hygienic. 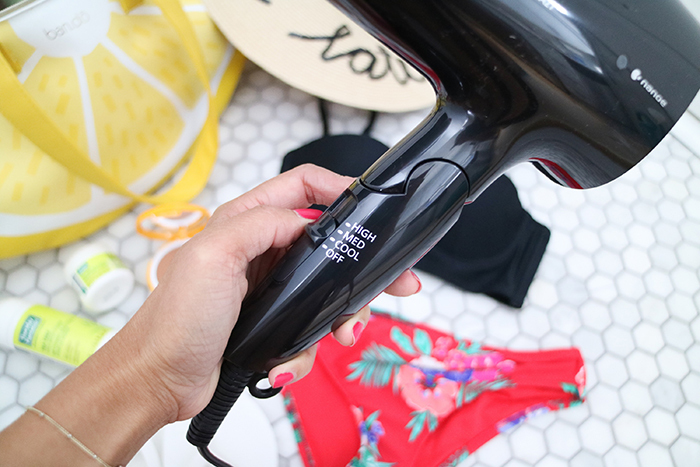 If you’re looking for a recommendation, the Panasonic Nanoe™ Compact Hair Dryer (available at T&T Supermarket locations or Panasonic.com for $99.99) is foldable, lightweight, and features a Quick Dry Nozzle, which means you’ll be ready in minutes. Plus, its proprietary Nanoe™ technology draws moisture from the air to fortify hair with microscopic moisture-rich particles that reduce the damage caused by everyday brushing, leaving hair smoother and shinier. It also comes with high, medium and cool airflow settings to cater to your needs. Straw bags and backpacks are great options to bring alongside to the pool but I am totally OBSESSED with this Lemon Super Chill Cooler Bag! It is water resistant, has a built in microfiber eva lining, and fits just about anything! I love that this bag also comes equipped with a few re-freezable cubes which means you can toss a few drinks and sandwiches to go as well! It’s so important to protect your skin from harmful UVA/UVB rays if you’re planning to lounge by the pool this Summer. So many people think that if you want a tan, you should skip the sunscreen, NOT true. So ladies, make sure you stock up before you head out and be sure to re-apply after each dip! 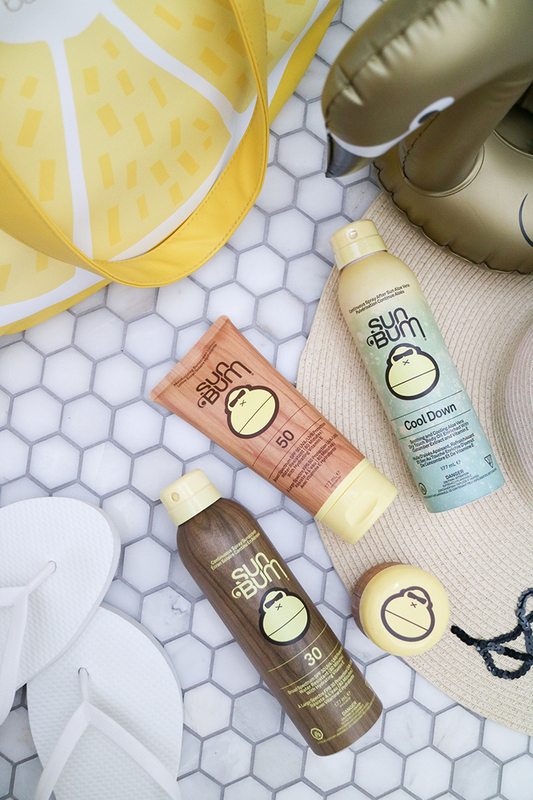 I was recently introduced to Sun Bum and totally loving it. Well first off, I was sold on the super cute packaging, but that’s not the only reason why Sun Bum is fab. The sunscreen products is ultra sheer, dry to touch and formulated with Vitamin E which helps neutralize free radicals – reducing the cause of skin aging. In addition, it is gluten free, paraben free, oil free, and cruelty free! A few products I highly recommend from Sun Bum is SPF 30 Original Spray Sunscreen, SPF 50 Original Sunscreen Lotion, Cool Down Original Spray Aloe Vera, and SPF 50 Clear Zinc Oxide. If you are able to freshen up after the pool, I suggest integrating a quick and effective 3 step skincare routine before reapplying your makeup. During the hotter months, my skin is more prone to acne due to clogged pores. Thursday Plantation carries an acne range that uses Tea Tree Oil to fight against bacteria. Start with the Tea Tree Foam Face Wash, followed by the Tea Tree & Witch Hazel Toner, and end with the Tea Tree Face Cream with Rosehip. 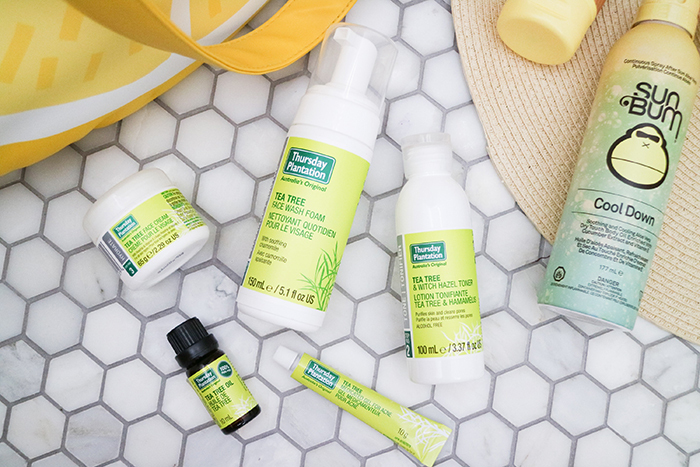 If you’re looking for an extra boost to fight against acne, the Medicated Gel and 100% Pure Tea Tree Oil are great options for spot treatment. This nifty beauty tool fits perfectly in my pool bag and barely takes up any room or added weight. I was able to dry my hair in just a few minutes after my sun-soaked afternoon this past weekend! Cheers to a season full of splish and splash! Disclaimer: This post was sponsored in partnership with Panasonic Canada but all other recommendations and opinions are authentic and my own!